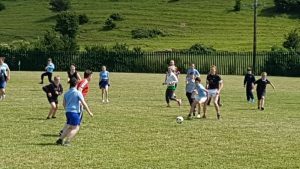 The 6th class pupils V staff soccer match proved to be a tense and thrilling game on the school pitch last week with the staff keeping their reputation intact with a very close and nervous 1-0 victory. There were a lot of pre-match mind games going on in the school in the week leading up to the event. 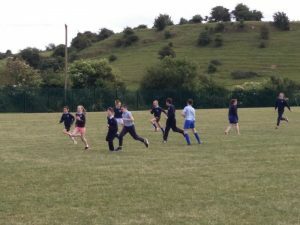 Pupils had the choice of which game they wanted to play including rounders, basketball, Olympic handball or soccer and they chose soccer. The referee for the game, recently retired flying winger and school caretaker, Davy Hoey had been studying the new VAR rules and was seen putting ear plugs in before the game began. The staff, one year older, stiffer and rustier, were nervous in the staff room in the build-up. 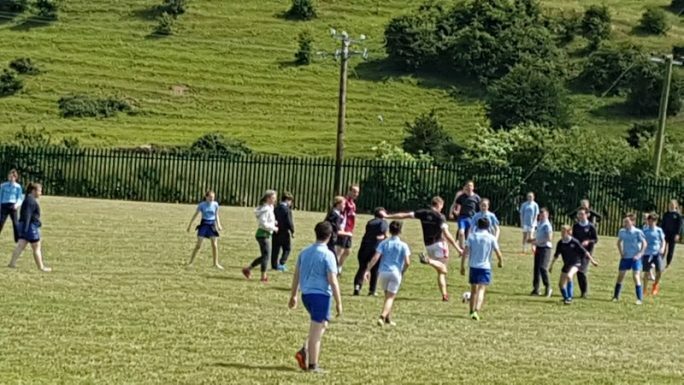 The weather was fantastic, and the pitch bank was full of pupils and parents, willing the pupils on for a potential first ever victory against the staff. 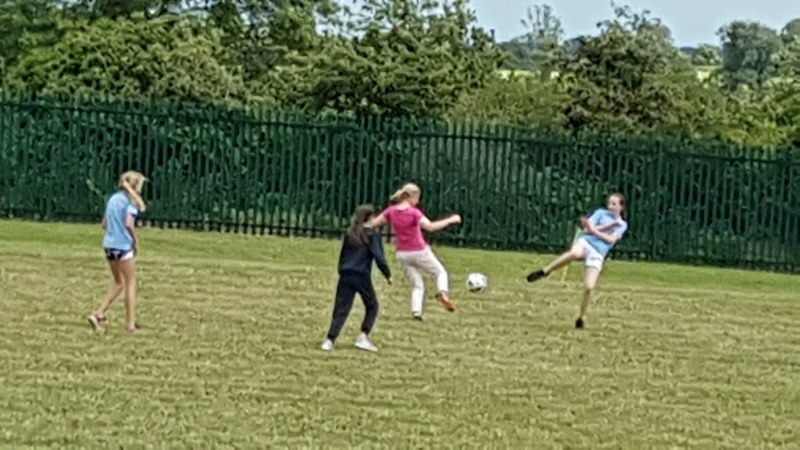 The main threat from the pupils centred around Altay Guneyer, FAI academy member and he did not disappoint, with some fantastic footwork around Mr. O’Connor and shots that fizzed past Ms. Gerrard’s post. The pupils also won the midfield battle throughout with Carla Keogh, Sarah White, Hollie Taafe, Cillian Brady, Jamie Mahony Manning and Conor O’Gorman ever present. 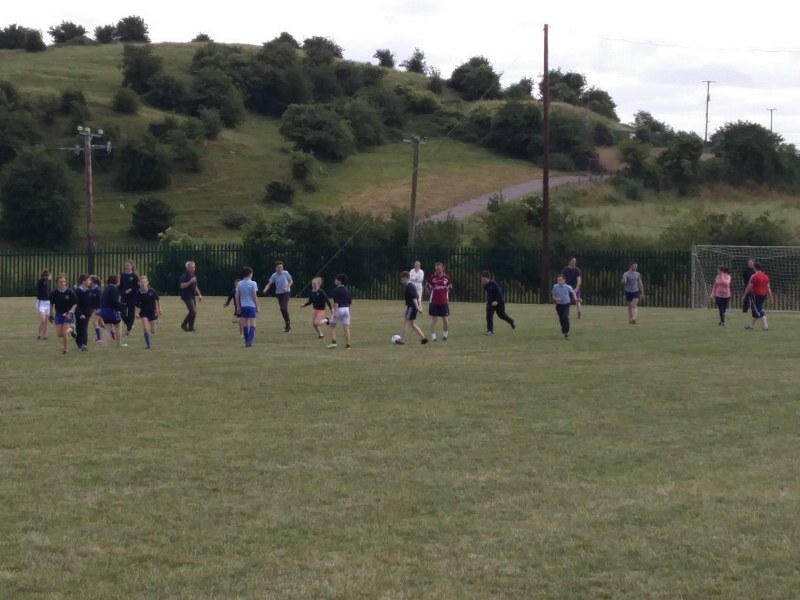 The withdrawal of Stephen Woulfe before kick-off was a loss to their side with rumours that Mr. Fagan had over trained him in P.E. the day beforehand. 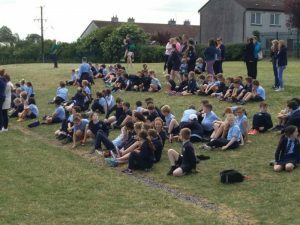 The staff, to their credit, grew into the game with Mr. Ó Braonáin and Mr. Flanagan launching scud missiles from the back. Mrs. Connor was like a Duracell bunny again up front, although afterwards, she looked like her batteries may take a full summer to recharge. 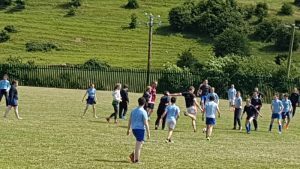 The all-important goal came from Mr. Fagan, who crushed the hopes of the pupils with a very well taken shot and earned the bragging rights in the classroom until the end of the year. 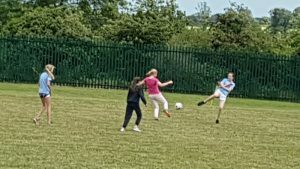 Pressure from the staff increased with the arrival of Ms. O’Brien late on who linked up well with Mrs. Goulding in the final third. 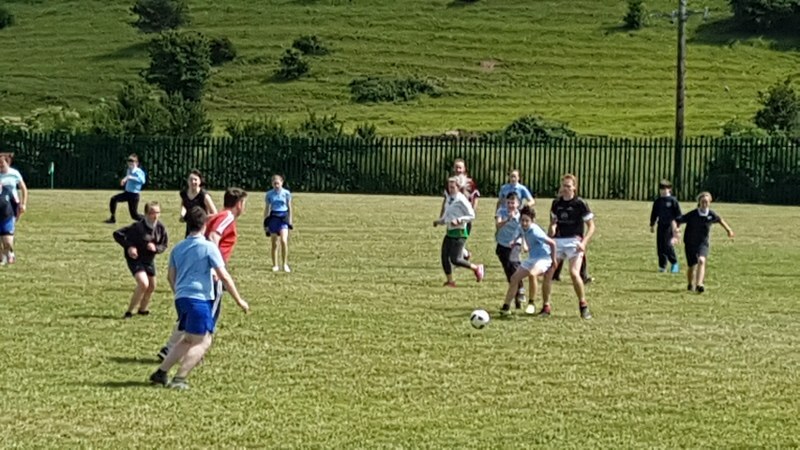 The winning gap may have been more but for excellent defending from Hollie Taaffe and Matthew Kealy and some outstanding saves from Aoife Lynch. Congratulations on a great sporting game from both sides. It was great fun.